The company continues in the tradition of companies EOH and E.S.H.&F, spol. s r.o. The history of the company begins as early as 1990 with the establishment of the company EOH, which was founded and managed by Doc. Ing. Bohumil Hála, CSc. 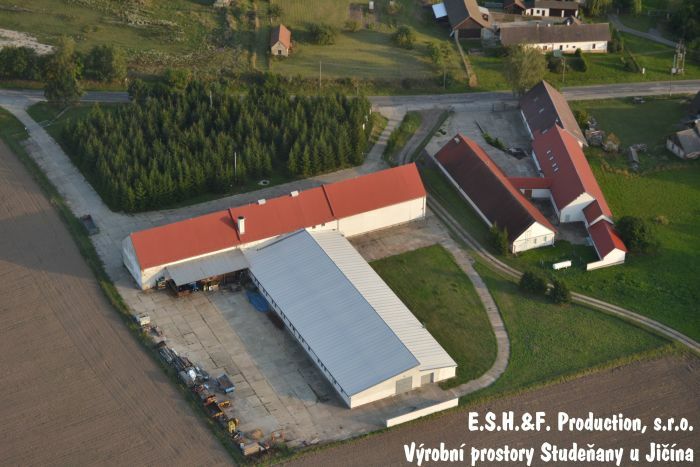 Both production assortment and production means of the successfully developing company with increasing volumes of production were transferred in 1995 to a new limited company with the trade name of E.S.H.&F, spol. s r.o. From the very beginning, production premises were established in Studeňany u Jičína. Mr. Jaroslav Máslo was authorized with the management of the Electrical Equipment Division. In the half of year 2015 was authorized Mr. Tomáš Vejvoda. Mr. Ludvík Mintál was authorized with the management of the Machine Operation. The Commercial and Technical Office is situated in Prague and it is headed by Ing. Zdeněk Hlavatý. In 2009 the company called E.S.H.&F. Production, s.r.o. was founded, which is linked to the tradition of both previous companies and continues with the production of the components of heavy-current electrotechnics.